It appears actual physical evidence of fraud no longer matters to the Queensland Police, Federal Police, ASIC or even the Financial Ombudsman Service when it comes to the big banks. (Real News Australia) What you’re about to read below is sadly not a unique case. There are dozens, if not, hundreds of similar cases just like this one around the country. Honest hardworking people battling their way through life like the rest of us. Buying a home, starting a business and doing what it takes to make ends meet. However, in this case it appears that not only did a mortgage broker but also Australia’s biggest bank colluded to ensure that stress, hardship and debt enslavement was the order of the day. Wayne Styles and his wife Carol moved from New Zealand back in 2004 to start a life here in Australia. They decided in early 2005 to contact Mortgage Choice to arrange finance to finish building a home and to start a new business. The evidence has shown that the broker was acting as an agent for the Commonwealth Bank of Australia (CBA) and arranged a line of credit to the tune of $389,000. Later it was discovered that the broker had actually applied for $540,000 without the knowledge, or consent mind you, of Wayne or Carol. Then in early 2007 hard times fell upon Mr & Mrs Styles. The bills kept coming but the income wasn’t quite there to match it. They decided to seek the assistance of the CBA and restructure the loan into something more manageable. A $300k home loan and capped line of credit of $70k was established. For a time this worked and was indeed manageable. However, in early 2009 there were issues keeping up with mortgage repayments. Wayne & Carol were struggling to stay afloat. Again they asked for help from the CBA to see what could be done. An appointment was made in a Gold Coast branch of the CBA so they could sit down with a lending specialist to help sort out their dilemma. As it turns out the dilemma hadn’t even begun. 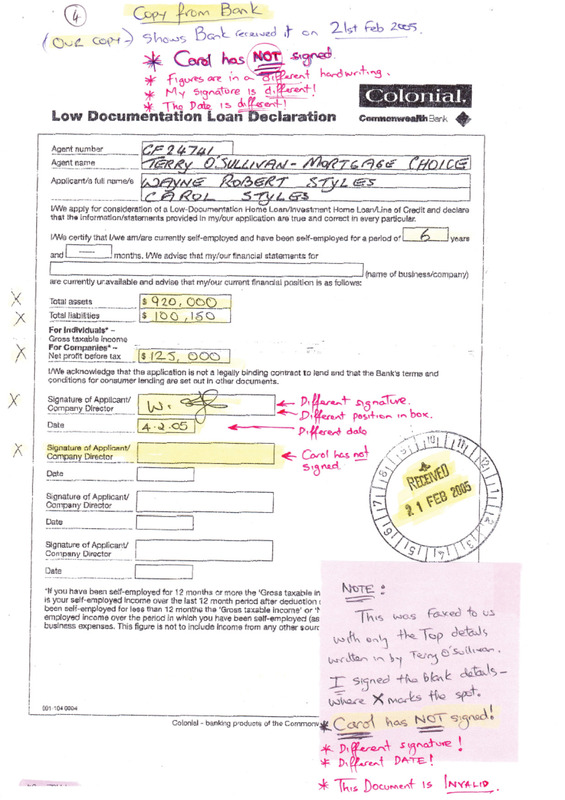 Overstated earnings on their 2005 loan application documents saying that his earnings were $125,000 when in fact he was unemployed! There were cars added as assets that they never owned (Toyota Prado). $50,000 worth of shares that they never owned. $63,000 in superannuation they never had. 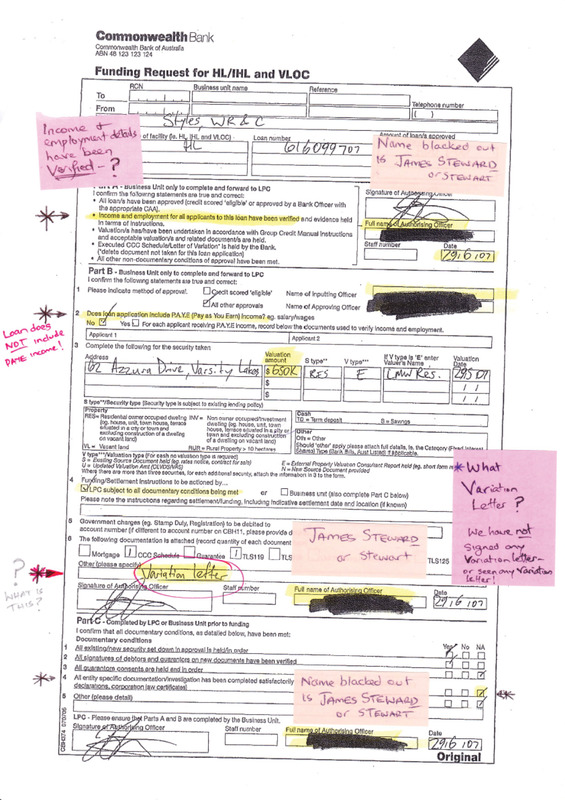 Fake documents showing dates that were previous to them even being in the country. 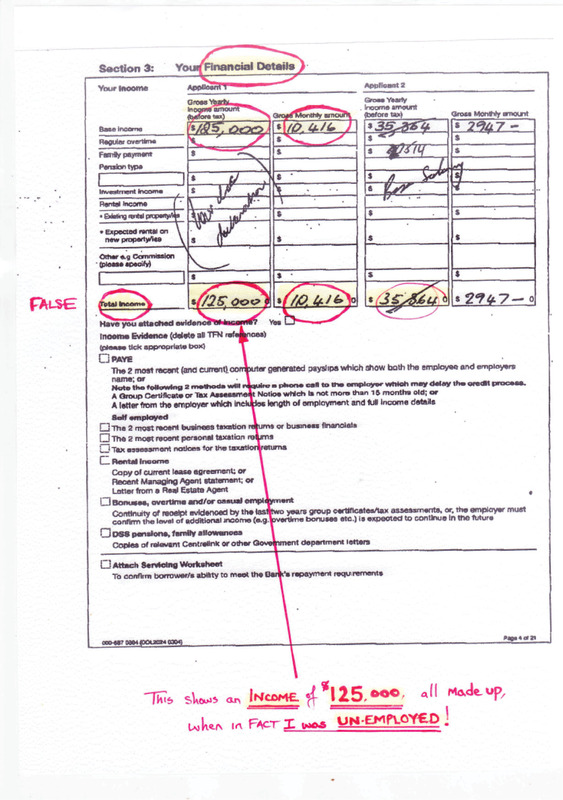 Documents that weren’t signed by either Wayne or Carol and in fact had a fake/photoshopped signature. 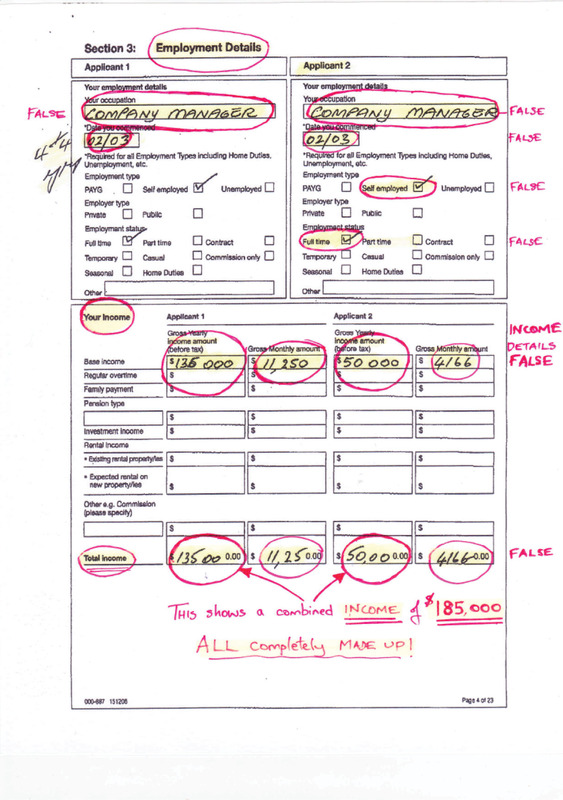 Wayne was quick to ask for a print out of the documents he had just seen as proof of the fraud. 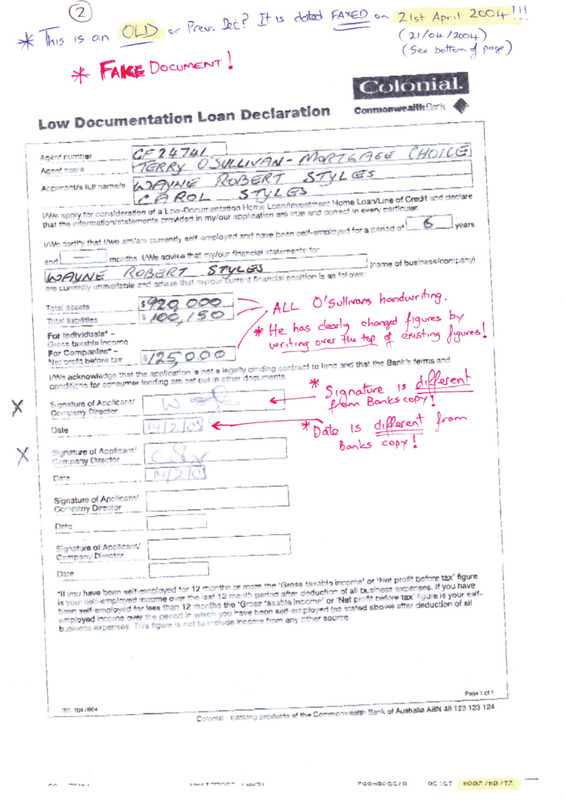 The CBA employee refused saying that it would make the CBA liable and open to prosecution! She said they would have to discuss it with their broker. 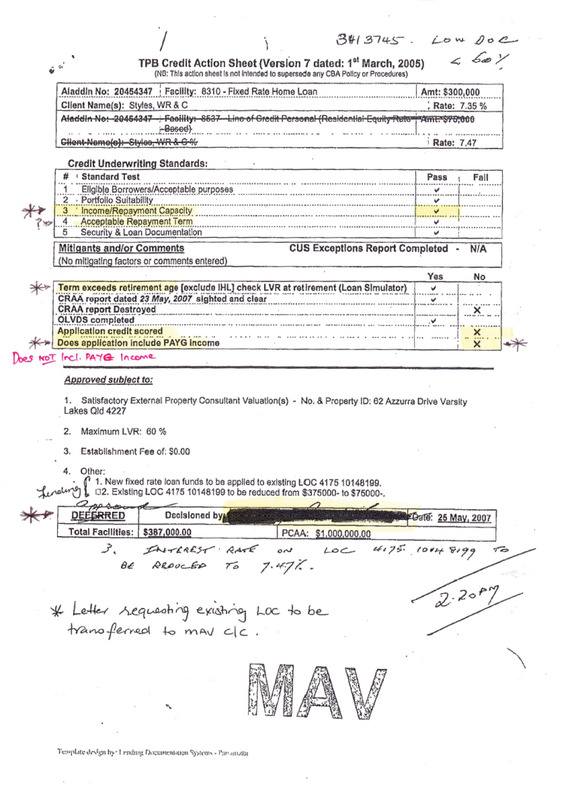 After weeks of calling the bank requesting copies of the loan documents and being refused, Wayne decided to write a letter to make a formal request for the documents from the first loan in 2005 touting freedom of information in the hope that the bank would give in. 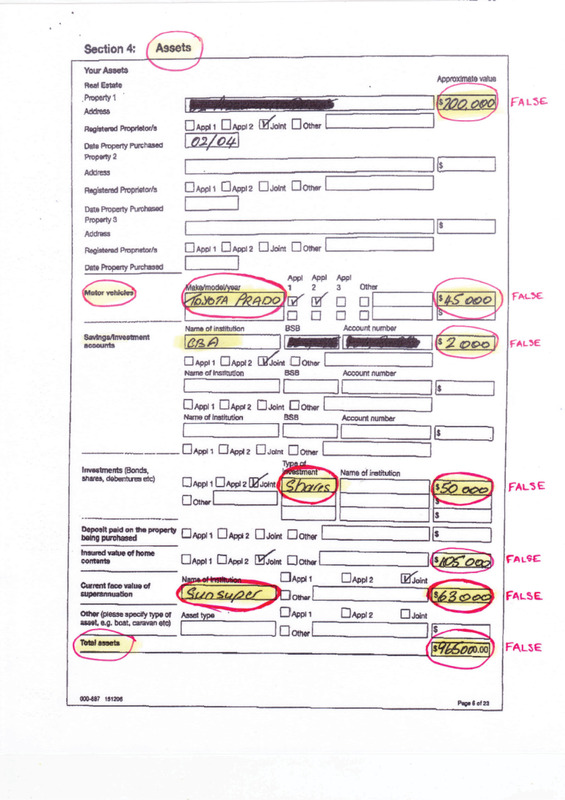 To his surprise he received the paperwork by post 3 weeks later and was absolutely astonished to see ALL of the changes to the documents that were made without either Wayne or Carol’s knowledge or consent. The question is why would a bank & broker go to so much trouble to fraudulently change a loan application to make it appear that the applicant can adequately service the debt when they know all too well that they cannot and will almost certainly default on their debts? Wayne’s next course of action was to visit a colleague by the name of Russell White who is the head of the National Federation of Independent Business, a small business advisory group. He went through the documents and gave Wayne advice to go back to the bank and sort it out internally. Wayne took the advice and requested the bank investigate the matter which when you think about it is like asking a murderer to investigate the murder of his own victim.The CBA of course said it had done nothing wrong and again instructed Wayne to go back to the broker. Wayne decided to go one step further and went to ASIC to make a formal complaint. The response from ASIC was less than enthusiastic. Their initial response was not to investigate Mr Styles’ accusations of fraud against the CBA. An outrageous response according to Wayne. He wrote back to try again and this time felt as if he had some success due a reply by a Mr Greg Hackett from ASIC stating they would review their initial response not to investigate. Wayne was feeling as though he had started to make some progress and even called Mr Hackett to ask him personally if he required actual copies of the fraudulent loan application documents. “Not at this stage as i haven’t gotten around to reviewing your case as yet”, was his reply. Then almost two months later came ASIC’s formal reply. Let’s just say that whatever little hope Wayne and Carol had mustered was soon drained away. Wayne & Carol were shocked. Shocked and now angered at the blatant disregard for the truth. ASIC openly stated that it didn’t have sufficient evidence and that they were unable to gather sufficient information when in fact they didn’t request any nor did they accept it when Wayne offered it up. Instead they suggested Wayne & Carol go through the Financial Ombudsman Service. In other words, ASIC wanted nothing to do with it. Unsure where to turn next, Wayne again went to visit his friend Russell White of the NFIB. Russell began talking to the FOS to open a case for Mr & Mrs Styles. Later down the track Russell had told Wayne that the FOS admitted ‘off the record’ to Russell that a lot was being covered up and to go to the police and make a formal complaint! We’ll get to that shortly. 3 long years later the Financial Ombudsman Service had finally finished its investigation. After many sleepless nights Wayne & Carol were again hoping for good news. Sadly they were again disappointed. The system had again let them down. Unbelievably the FOS decision, after having been presented with all the fraudulent documents, all the proof it needed, all the proof anyone capable of reading the written word needed, was in favour of the bank! Even more unbelievably during all the correspondence back and forth between the FOS, CBA and the Styles’, Wayne had mistakingly received a letter from the FOS legal department which openly stated it found out that the bank was guilty of mal-administration! Even with this letter from their own people, the FOS still found in favour of the CBA. Wayne went back to Russell White for more advice. Their next step was to contact Local MP Karen Andrews. After viewing all the evidence and the decisions by both ASIC and the FOS, Karen agreed the police should be involved. Wayne went to Robina police station and met with an officer and provided all the documented evidence and made an official statement. After first hand experience knowing how long it took things to move he followed up about 2 weeks later to see how the case was progressing and was told by the same officer that the documents have gone missing! Another set of copies was provided a few days later and Wayne was then referred to the burleigh heads Criminal Investigation Bureau. The CIB were informed by the Commonwealth Bank of Australia that they have destroyed the original documents! And even more shocking still… armed with this new shocking information the CIB declared it won’t investigate his case any further! The CIB told him it’s now a civil matter. Wayne has hit a brick wall and is unsure of his next step. There are those of us out there that would simply walk away from this loan and not pay a single cent more. Especially considering that the bank no longer has the original loan documents. No documents. No loan? Possibly. Russell White has contacted a barrister on behalf of Wayne and may be able to sue the bank. Wayne has also written the CBA to say he wants the loans written off and is seeking compensation. He marked the letter to the attention of all standing directors of the CBA which has been totally ignored. Could Wayne have discovered the key to this all along? After all is it not true that the fifth maxim in Commercial Law is “AN UNREBUTTED AFFIDAVIT STANDS AS THE TRUTH IN COMMERCE”. Claims are made. If they go unchallenged, they emerge as the truth in the matter. What is worse than a corrupt State? A corrupt fascist/communist State. Welcome to the New World Order (in progress right now). But she’ll be right mate, get back to your corporate/govt controlled, censored telly, sports and other trivialities while Rome Burns. Don’t believe me? What have you heard on MSMedia about UN Agenda 21? Bilderberg Group? Club of Rome? Go on youtube and watch “Agenda 21 For Dummies”, and”Alex Jones Infowars” for the U.S. angle, and for an aussie angle listen to Fair Dinkum Radio dot com and get yourself out of the matrix. The CBA will get away with this because he is white. For the dimwit commenting above… Alex Jones is part of the disinfo do your research…. why do you think he call’s it info wars..?? just like the war on terror and drugs…. same people calling the shots for A Jones too…. We are living in their system.The truth is arbitrary and can be formed by consensus.